Thanks again to everyone who participated in November's AHIQ link up. I am loving link up week - I'm finding it exciting, inspiring and stimulating; such a range of styles, of ideas, and of techniques, and some great discussion post too. One of the things I have been reflecting on it that it seems often to be easier for people to work in an improvisational way when they are using scraps; cutting into yardage is somehow harder. I am as guilty of this as anyone - in fact one of my sticking points is often that I am trying too hard to preserve a fabric when I should be thinking about how to cut it. Mostly I find this applies to large prints; smaller prints, spots, stripes, tone on tones, these don't create the same issues. Inner City is a good case in point. Look at these three pictures: the uncut fabric, my first try and the final version. I love this print of New York and didn't really want to cut it, so was very cautious too start with. I don't know about you but it just didn't work for me. It felt too heavy, too static. I was respecting that fabric just a bit too much. It looked much better it was when I got over myself and sliced it up. There are always fabrics that deserve to be the star of their own quilt. It doesn't have to be complicated; I am often happy to use them in sizeable pieces, but they could also become - let's say - the centres of circles, a good big border, the choice that enlivens free pieced birds or houses or pretty much whatever takes your fancy. It doesn't have to be complicated. Let's face it, if they don't get chopped up, they end up living in a box somewhere (the garage in my case). With this in mind, the challenge this time is a simple one: pick up a piece of fabric you love, that you are saving for just the right time, and make this that moment. You don't have to go overboard and reduce it to 3" squares but look carefully and see if there are options that naturally occur to you, understand what it is you want to preserve and think about ways you could do it. I believe that if we become more comfortable starting without a hard and fast plan but with faith in our instincts, we can eventually feeling okay slicing into quilts that are already well underway. (And I know that this is not for everyone, but like precision piecing there is a place for every skill, I think). Now pick up your scissors or your rotary cut, take a slice and see where it leads you. Labels: AHIQ, Eden's birds, improv, Inner City, Why don't you try this? I didn't realize that Inner City had started with a big print like that! It definitely evolved a lot, and I agree, it's much more interesting now. Great post! Great challenge. I have struggled with the same hesitation to cut into some stunning piece of goods. I think the reason your first version of inner city didn't work for you is that it was still someone else's art. You found a way to make it your own. Lol You're reading my mind! I already have a fabric in mind, been thinking that it's time to just do something with it even if it turns out to be wrong. 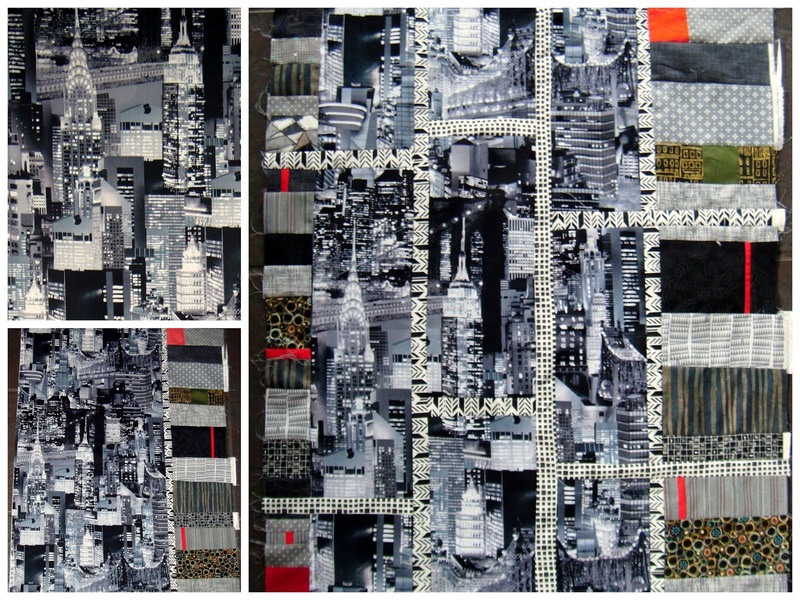 :) Love your Inner City quilt. I remember following along with your progress and seeing how much better it looked when you started cutting into it! Waiting for inspiration to come can be frustrating, but a good jump start, like cutting things up, can really help. I only ever buy a quarter or half a metre of anything, so I don't really have any issues cutting it up - maybe it would be more of a challenge for me to try and do something without any cutting. Something to ponder, thank you! This is a good challenge. I think I'll take you up on it. Actually I can think of a heck of lot of fabrics that are waiting for the "right moment", too many fabrics in fact. I shall have a look in my specials! You definitely have me thinking--of all the beautiful fabrics in my stash that I was unwilling (or afraid) to cut, so they've sat and sat and sat. Now they are a bit past their prime. I'm using them, slowly, but there are times that I pull them out because I feel guilty. I imagine my challenge is first to adjust my attitude (and guilt) and also to get busy on some of those fabrics. 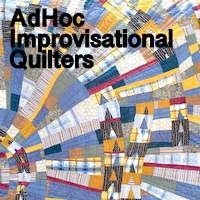 I love what you did with Inner City, but the second quilt--with the flowers--is a perfect example of what I need to consider with my fabrics. Of course, I'll do my own thing, but I love the big cuts mixed in with smaller cuts. Like Stephie, I have mostly smaller cuts.but there are a few larger pieces that are in danger of being preserved whole. Something to think about this month. Okay, Kaja...I'll give this one a go. I've been kind of anti-print lately and I need to get over myself. This is a great challenge. Great challenge! will be fun thumbing through the stash to decide on a favourite print too! This has always been my hangup with big beautiful prints Kaja. I finally started busting through it when I made a string pieced quilt out of Kaffe fabrics. Still the urge is to preserve whole a fabric you love. I really love how you broke up the city fabric in the final version! Ok, I LOVE Inner City and that other quilt too. BUT my hands are trembling and my stomach is churning thinking about cutting up some stashed fav prints without a plan in mind to begin with! But I'm with some of the others who say they buy small pieces of fabric...that's me too. I buy small pieces so I have lots of variety. Any big pieces are usually for backings.